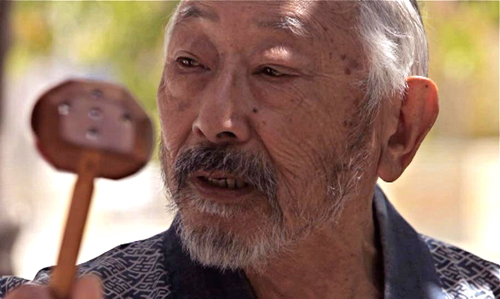 Hiroshi Kashiwagi, 91, has been writing and performing since he was 15 years old. With 76 years of experience under his belt, he’s still going strong. Recently, Kashiwagi held a reading before the screening of “Infinity & Chashu Ramen,” a movie he stars in, at the Wing Luke Museum. “I just enjoy writing and it came rather easy for me,” Kashiwagi said. He usually writes about personal experiences or experiences of other people he knows. He has four books and numerous plays under his belt. He is considered one of the early pioneers for Asian American theatre. His book, “Swimming in the American: A Memoir and Selected Writings,” received the American Book Award. He grew up in a small town, Loomis, Calif., where his parents had a fish market. During the reading, he read a poem called “Tofu,” where he talked about grinding the soybeans after school at his parents’ shop for two hours a day. During World War II, his family was sent to Tule Lake War Relocation Center. There Kashiwagi was a part of a theatre group. During his reading, he read a piece about visiting Tule Lake 30 years after being held there. While in the camp, he was forced, along with other Japanese, to answer a form. Kashiwagi refused to answer two questions, one that asked to swear allegiance to the U.S. government and the other was to renounce his allegiance to Japan. Because of his refusal to answer, his family was ostracized. After the Renunciation Act of 1944 was passed, he and others renounced their U.S. citizenship under pressure from the U.S. government. He went to University of California Los Angeles (UCLA) and received a BA in Oriental Languages. He later got his citizenship back with the help of Wayne Collins, a lawyer who helped many people in the same situation as Kashiwagi. He also graduated with a Master’s in Library Sciences from UCLA and spent over 20 years at the San Francisco Public Library. After retiring from the library, he was cast in “The Wash,” a play by Phil Kan Gotanda. He also appeared in a few films, including “Black Rain.” Kashiwagi is still a member of SAG, although there are few parts to come by for a man his age, according to him.